This is a photo that I took on Guy Fawkes Day when my English class had its lecture in the amphitheater. 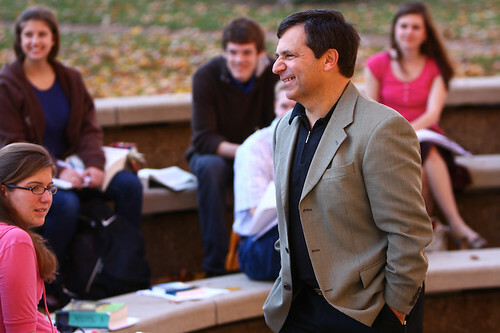 I like this shot of Dr. Freeh. I really enjoyed his English class. In other news, I had a great day today. I had lunch with a long-time friend, edited some photos of Hillsdale’s swing club (finally), and went to dinner with my girlfriend Amanda and my cousins Henry and Jackie. After dinner we went back to Henry and Jackie’s house and played Cranium (Amanda and I won) and two games of Pictureka (Henry won both!). I had fun. Oh, a note on comments: I was getting an insane amount of spam in the comments, so I installed Akismet and set the comments so that someone must have a previously approved comment or have the comment approved by me before it appears. Don’t worry, I do not delete comments at will, I just wanted to cut down on the spam. So far, Akismet has done a great job and only a few spam comments have shown up in the pending queue. If you are an actual person posting a legitimate comment and not spam, I will approve your comment and once you have an approved comment, your comments will not need to be approved, they will show up automatically.